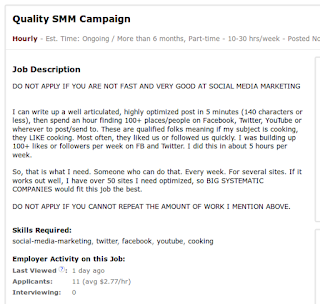 Direct Response Copywriting: Quality SMM Campaign ? 100 posts per hour? 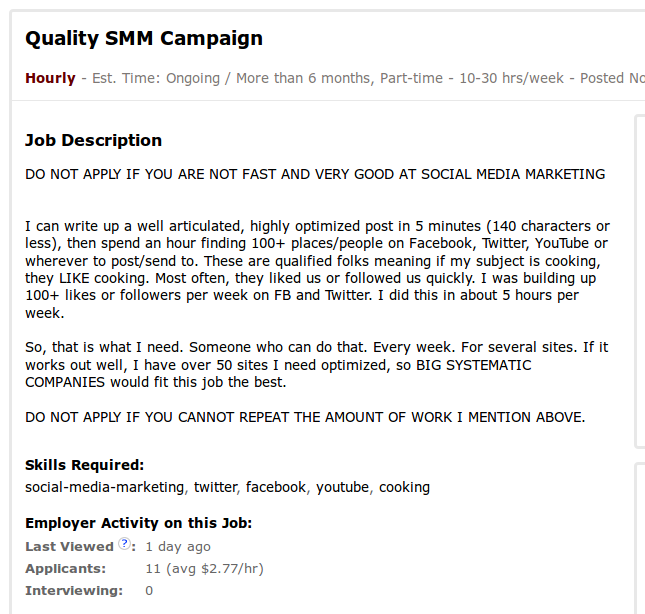 It's obvious that this employer is planning to spam social media. To top it off, this person has 50 different sites that he/she wants you to promote. This is a misguided notion of how social media works. The way he/she sees it, is that, by having a real person spam the different websites, he/she is going to make money. Spamming these online communities, the message they are sending out will have very limited exposure. Either the contractor will get banned from the community or their target audience will simply click on 'Unsubscribe'. In time, it is going to be consistently more difficult for the spammers to get their message across. How then, will I do things differently? Looking at the average rate for the applicants, we can see that it's about $2.00 per hour. Ten hours a week, four times a month and in three months, that's $240 per contractor. Instead of paying contractors $240 over a period of three months, I'd invest that to either a Facebook Ad, or Google Adwords. This way, my message will reach my target audience, which gives me better leads and higher conversion rates. While the ads are running, I'll make sure my website is optimized for SEO (search engine optimization). This makes it easy for my audience to find me when they make a search for my keywords. I will also have a SMM professional who can both influence public perception about my brand as they engage my audience.